Can You Do Total Body Workouts With Kettlebells Everyday? Kettlebells can help you look and feel healthy. If you have trouble finding time to fit in exercise with all your other daily responsibilities, a kettlebell workout might be the ideal solution. Kettlebells provide a cardiovascular workout as you build muscle throughout your body. Using kettlebells can give you a total body workout as long as you include a variety of moves and stick with your program on a regular basis. Talk to your doctor before starting a new exercise routine. Following the guidelines for the right amount of exercise is an essential way to ensure that you're getting a total body workout. This includes getting your heart rate going and working the muscles throughout your body at the same time. The Centers for Disease Control and Prevention recommend at least 2 1/2 hours of cardiovascular exercise each week. It's best not to do a kettlebell routine every day to give your muscles a day or two of rest. 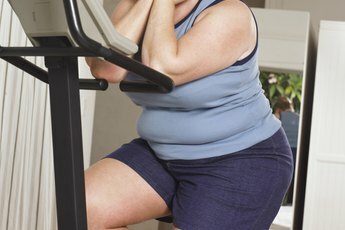 MayClinic.com recommends at least two 20- to 30-minute strength-training sessions each week. Many of kettlebell exercises, such as swings, require repeated movements with the weight, which elevates your heart rate and burns calories. The trick is to keep the movement up for at least 10 to 15 minutes at a time to make it beneficial. For the best total body benefits, include a variety of moves that work your entire body during each session. Kettlebells are strength training tools, even if they do provide cardio at the same time. For this reason, follow proper safety techniques, much like you do with traditional free weights. Choose a kettlebell with a load that allows you to complete 12 repetitions with good form. 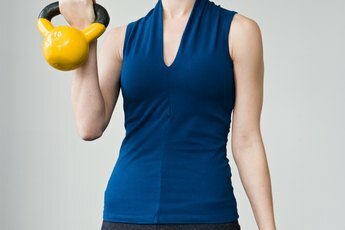 If this is too hard, choose a lighter kettlebell and if it is too easy move up a size. Virtually any kettlebell move is going to be beneficial to some part of your body. Moves that combine cardio with strength training are your best bet for working your whole body. Kettlebell swings, Turkish half-get ups, shoulder press, halos, kettlbell lunges, cleans, windmills and snatches are ideal moves to add to your routine. Each move targets several muscle groups, including your arms, legs, back, core, shoulders and chest. Mix and match your favorites during each workout to keep your muscles challenged and burn calories at the same time. You don't have to hit the kettlebells for hours at a time to benefit. The American Council on Exercise suggests alternating the number or repetitions and sets at each workout. For example, do one circuit of 10 to 12 repetitions on one day and two circuits of eight repetitions on another day and three circuits of 10 repetitions the next day. The variation in your routine prevents your muscles from adapting to the moves and slowing your progress.